An exciting game that you have a chance to play right now! You should serve the fire and using his minions bring him sacrifices. Use all tips and you will do it! It must be really cool, we promise you! 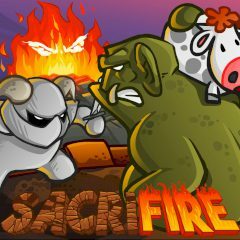 This is the story about the fire who has devoured the cows. But, once his army refused to bring him new sacrifices. Unfortunately the fire has his minion that are always ready to serve their master. One of them is Orc and he is only the one with the ability to pick up the cows, or another one is Kamikaze Jack and he explodes upon contact with enemy and kills it. He is the only one with the ability to take down an enemy by blowing himself up. So, if you are ready to help the fire, then do it right now and do not waste your time! Be sure, this will be really cool!